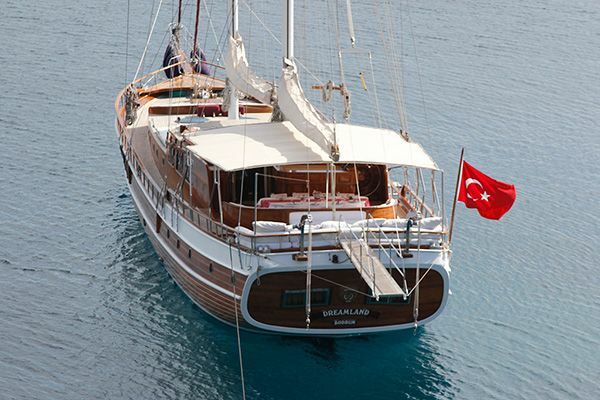 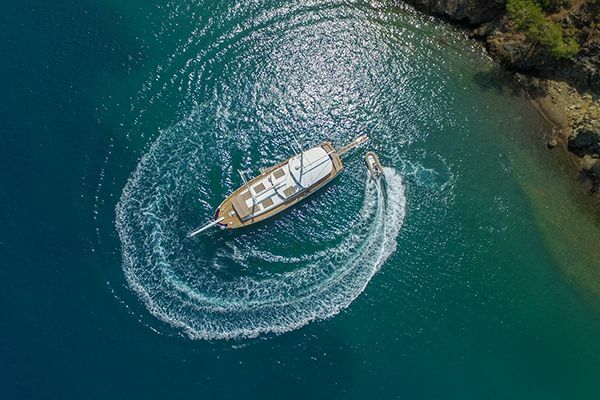 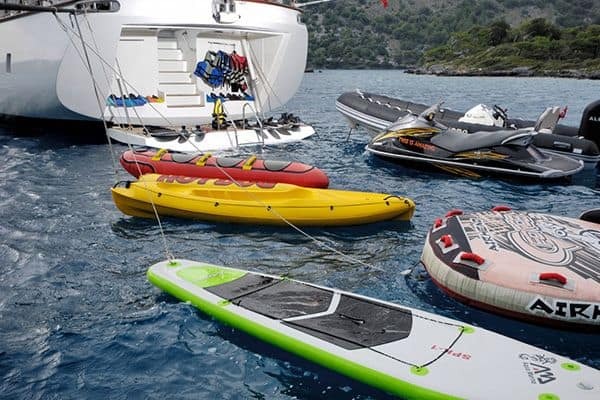 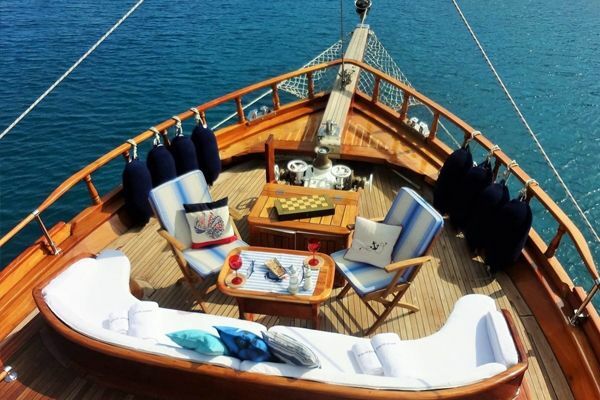 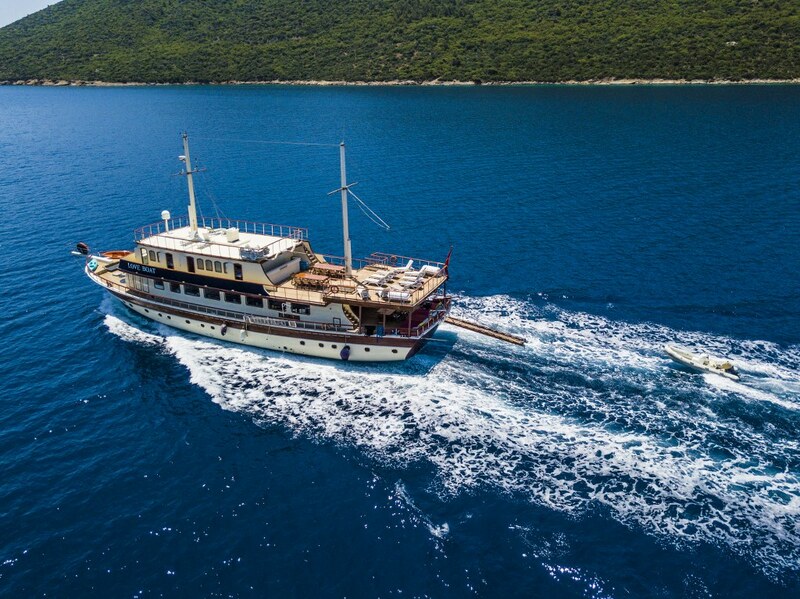 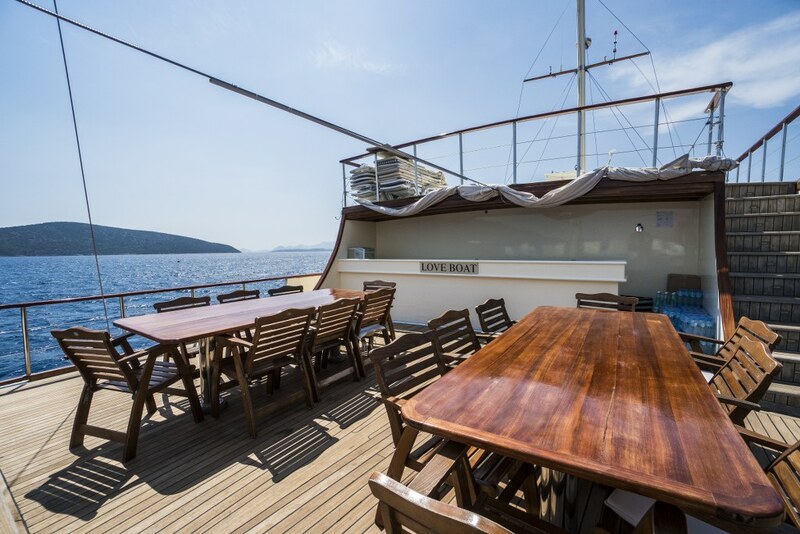 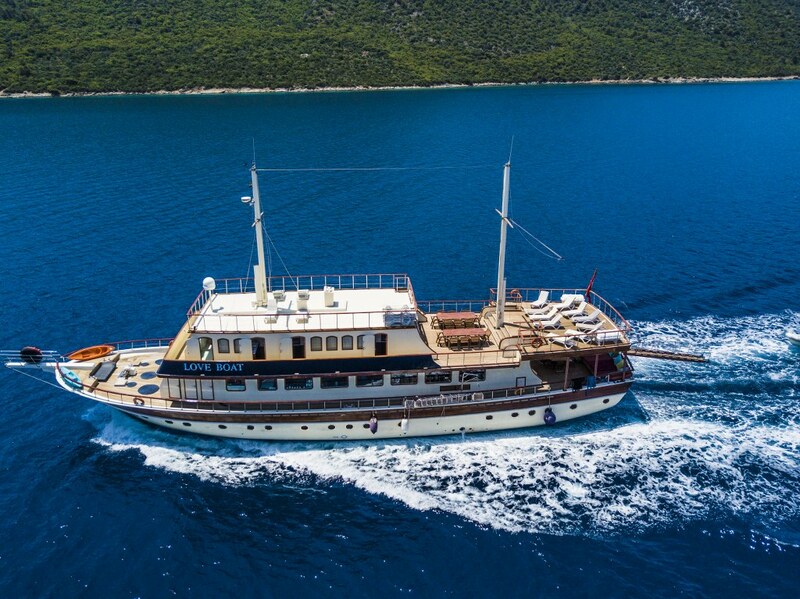 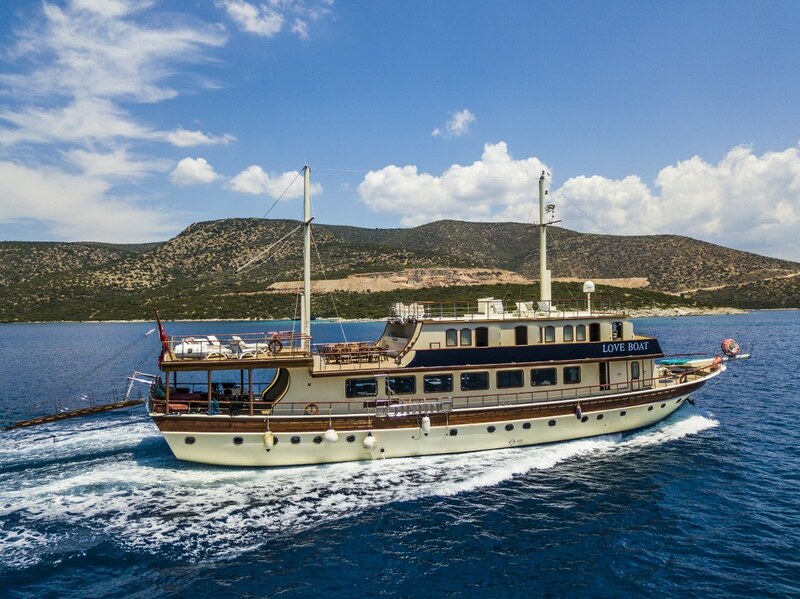 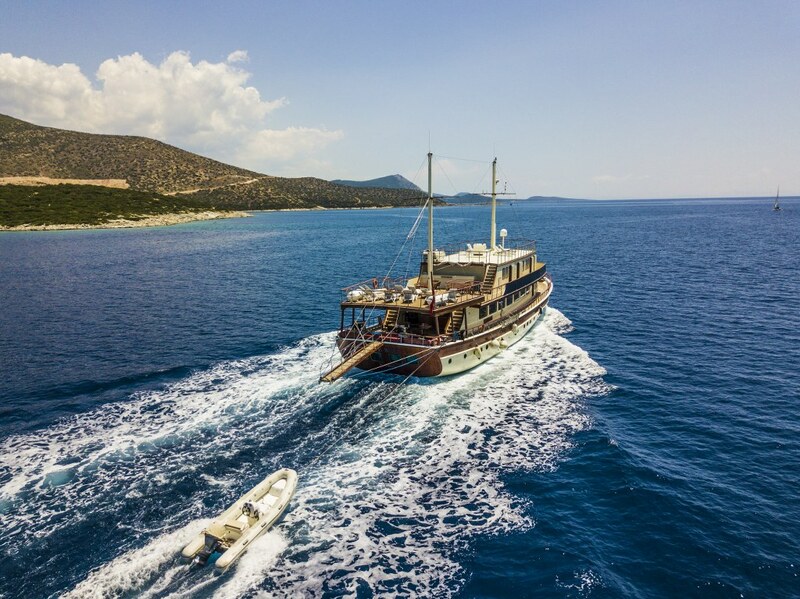 One of the largest gulets on theTurkish coast, the motorsailer Love Boat ( formerly named gulet BB II )offers the best of luxury gulet style holidays suitable for events, corporate meeting and incentive groups, or for a large group who desire a very enjoyable cruise. 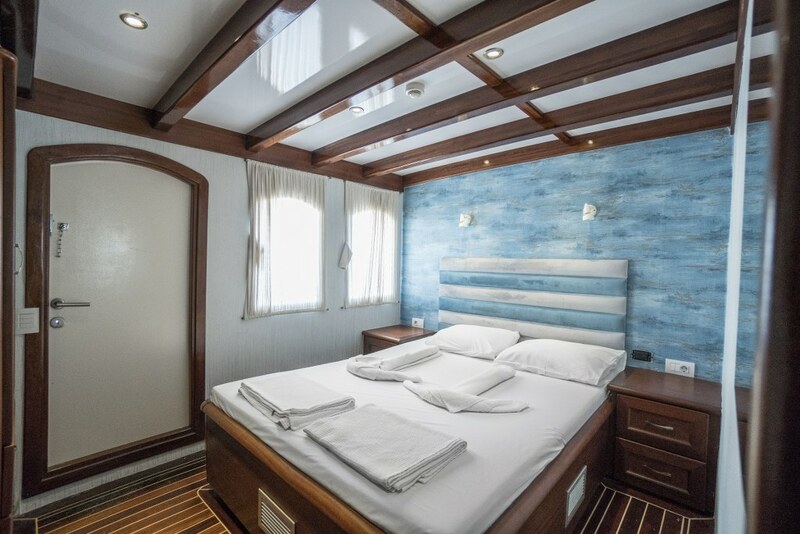 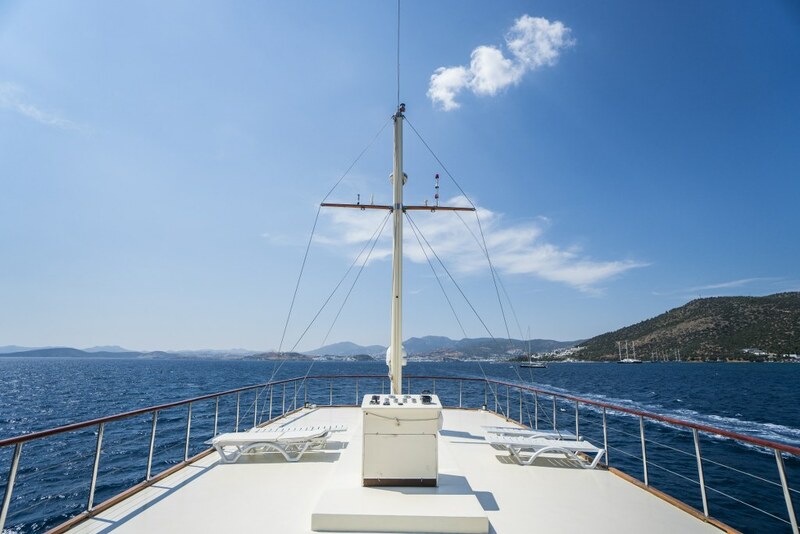 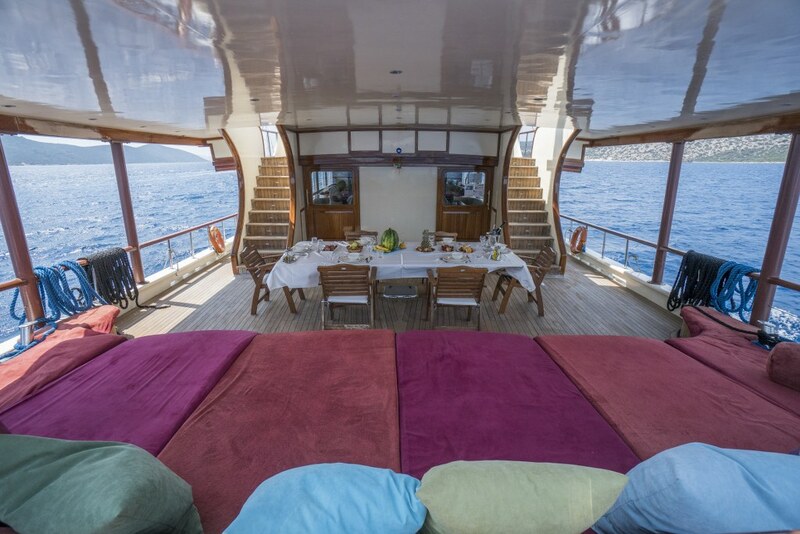 With comfortable cabin acommodation for up to thirty-two guests who can relax, dine and enjoy the experience on a crewed yacht holiday along theTurkish coast or amongst the Greek Islands of the Aegean, the motorsailer LOVE BOAT offers the space, power and value for a luxury standard cruise. 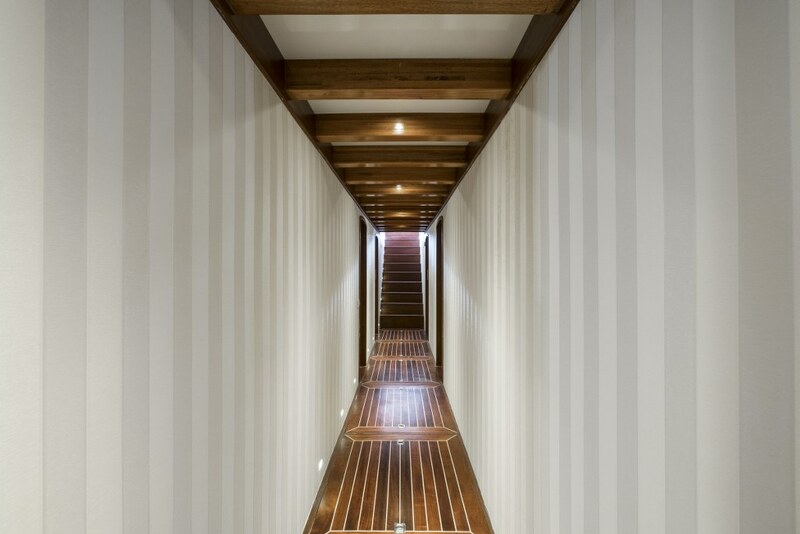 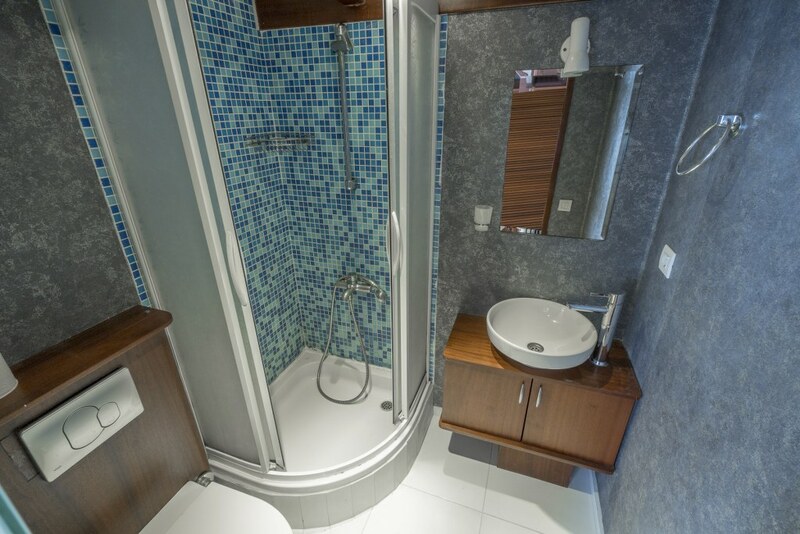 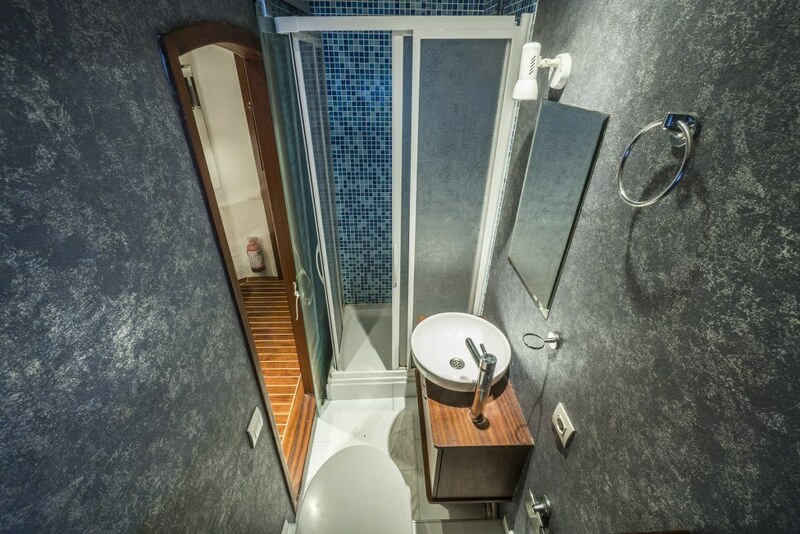 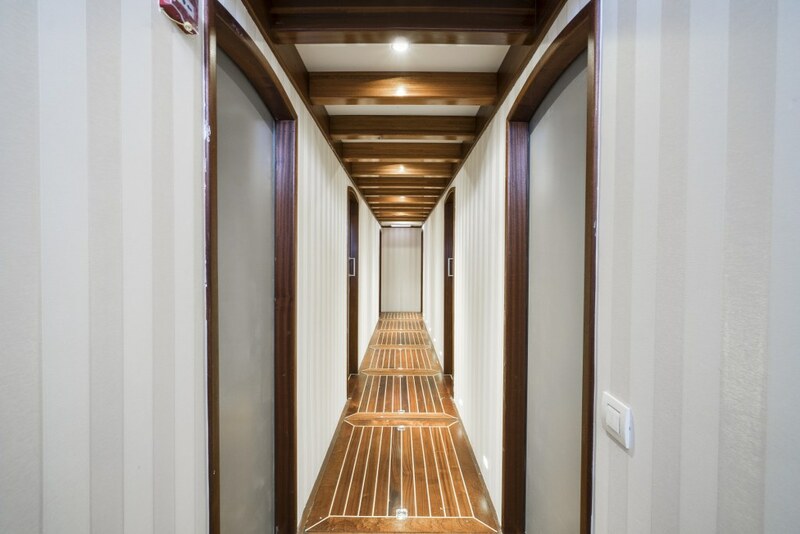 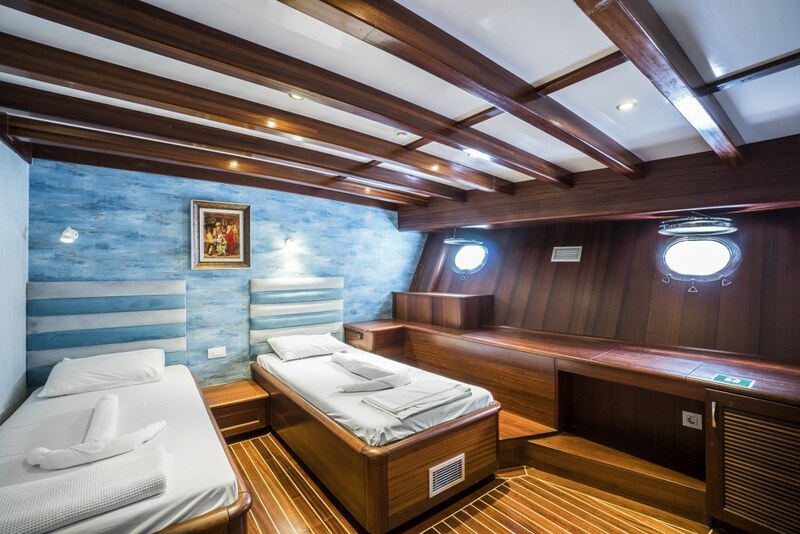 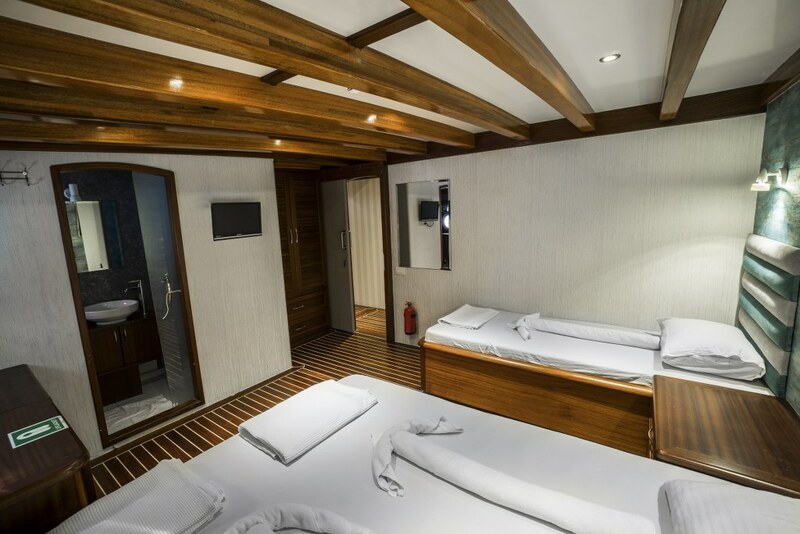 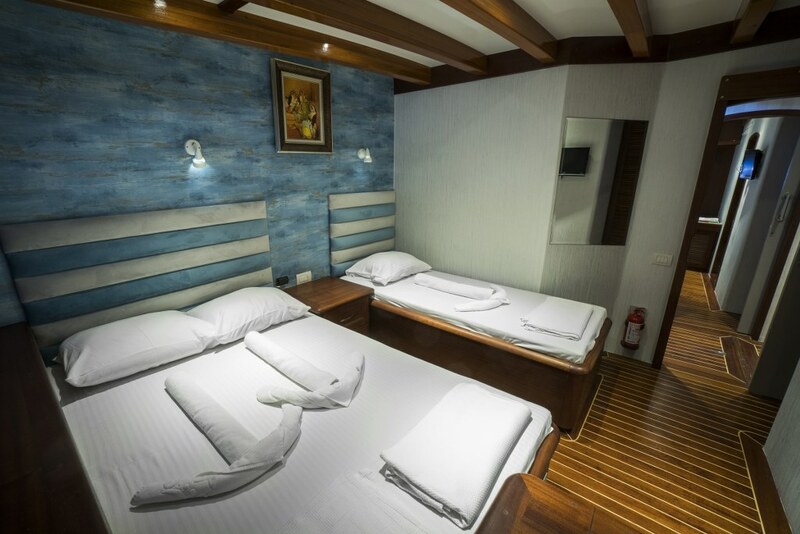 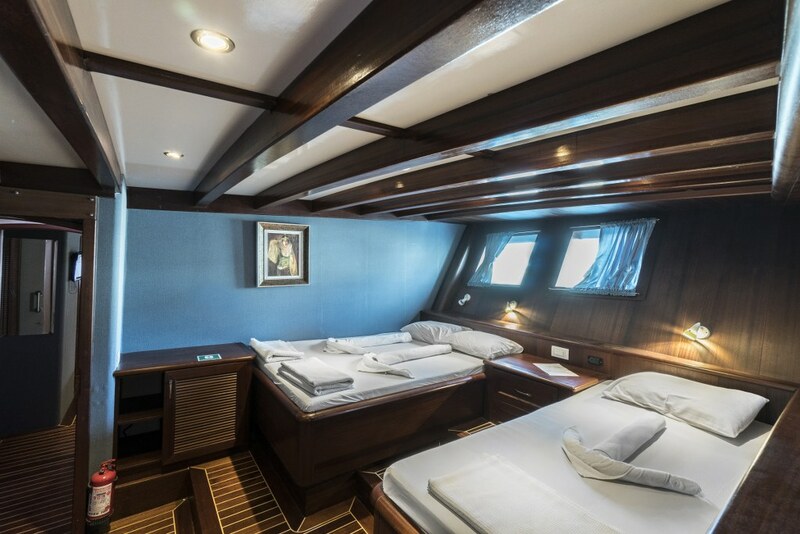 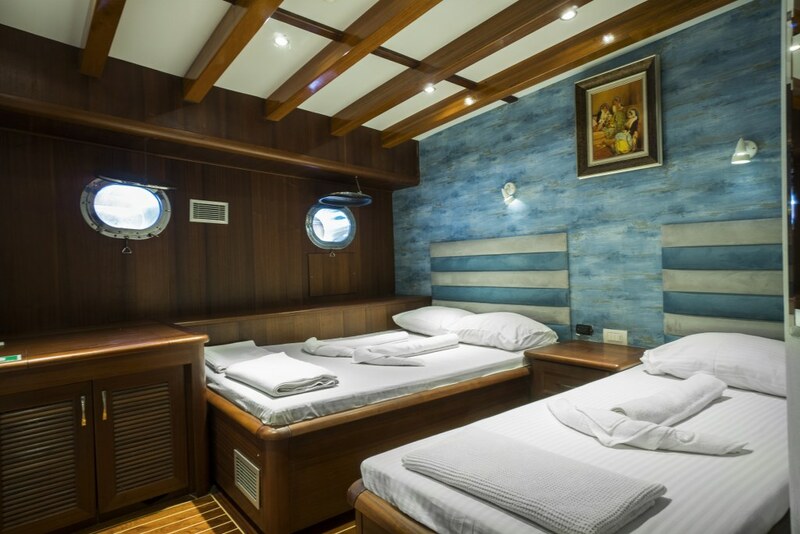 The sixteen cabins are equal-sized and fitted out as six double bed cabins, eight triple (double bed +single bed) cabins and two twin bed cabins each equipped with a separate bathroom with shower, WC and basin, and storage and portholes but also with air conditioning available. 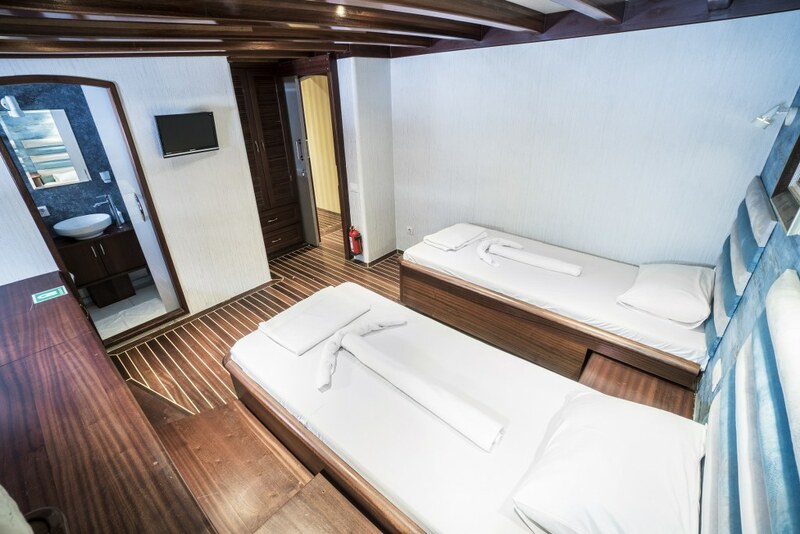 The six double bed cabins are located on the top deck. 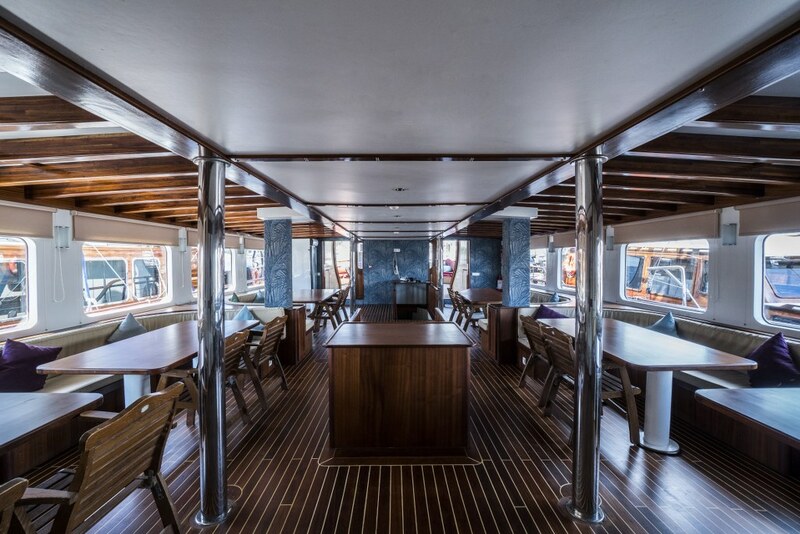 The main deck holds the indoor saloon which enjoys air conditioned comfort with spacious areas of long bench seating, dining tables and relaxation areas with a full TV/DVD and music system installed. 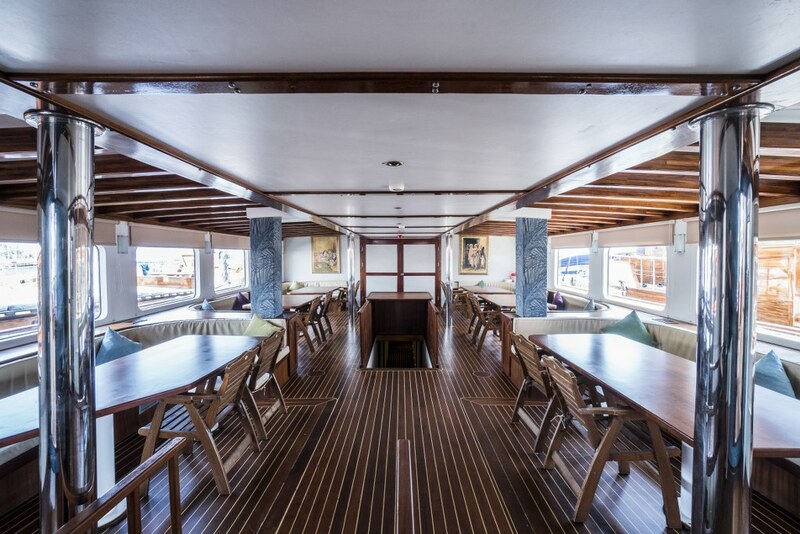 The galley has direct access to the saloon, where the main meals are served, but there is also full capability for serving meals in the delightful al fresco settings at the stern of the main deck or on the upper deck dining tables. 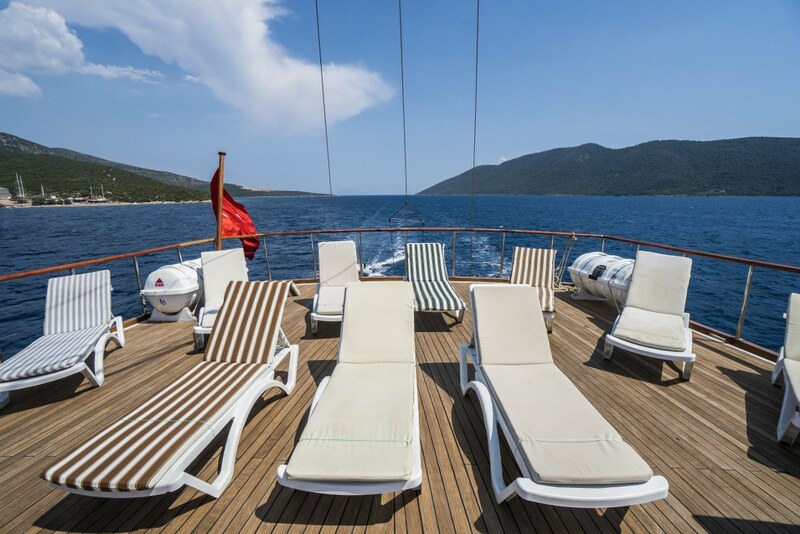 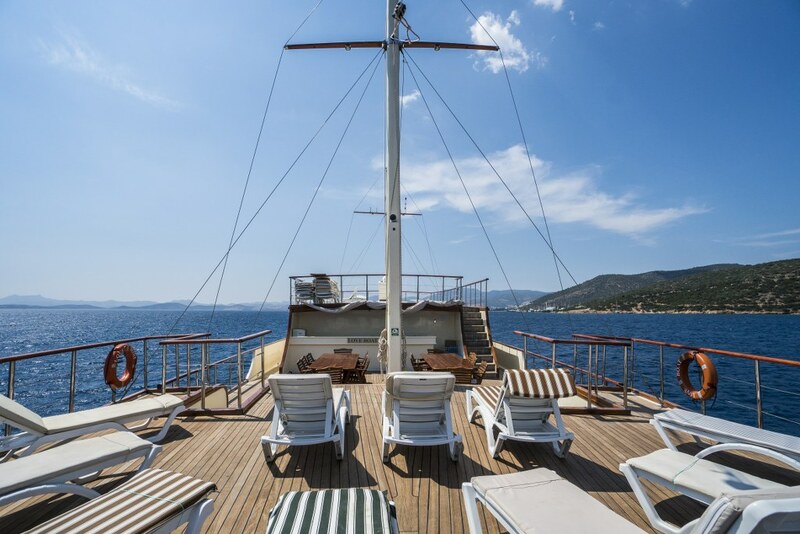 The upper deck with ample deckchairs and sunbeds is the preferred areas for the sunseekers, while shade seekers may find padded benches across the stern just perfect for some relaxed reading or social time. 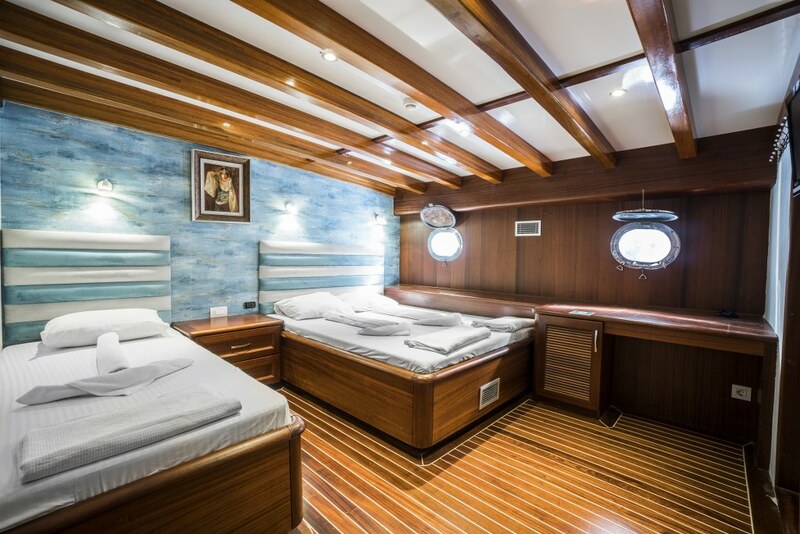 The professional and hospitable captain, chef and crew of four, who have their own separate quarters, attend to all the meals preparation and service, bar service, cleaning, boat care, and use of water toys and equipment by guests. 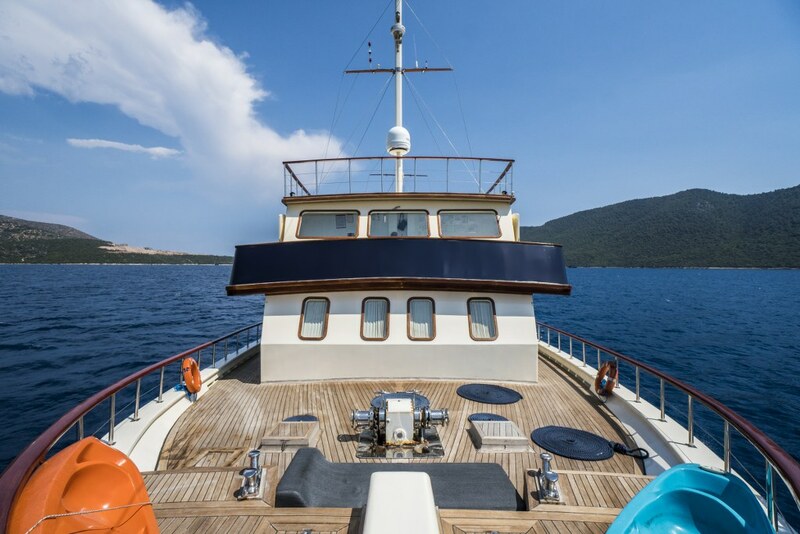 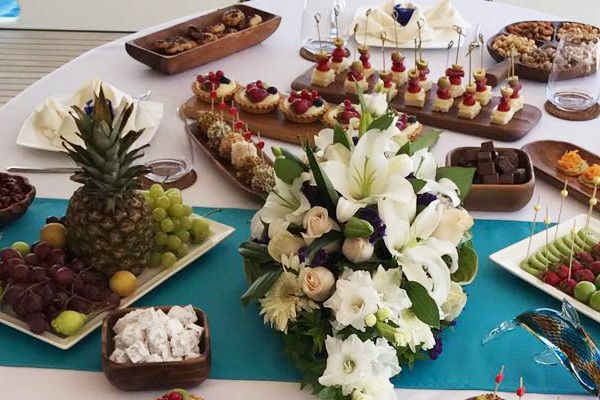 They will do all they can to make sure that the guests enjoy their cruising holiday on the Aegean and Mediterranean coasts of Turkey. 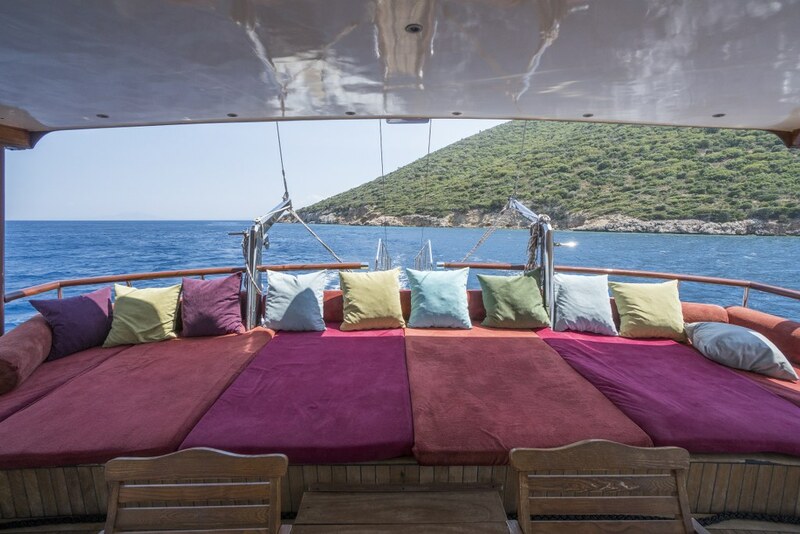 As a motorsailer charter the LOVE BOAT not only offers cruising itineraries along the Aegean coast of Turkey, but is one of the rare yachts which is licensed to carry its full complement of thirty-two guests among the Greek Islands of the Dodecanese such as Rhodes, Symi, Kalymnos and Kos, and to the Cyclades Islands of Mykonos, Naxos and Santorini, all of which offer beautiful scenery, fascinating villages and quiet sheltered bays where the active can explore ashore, or play on the water toys available on board including water skis, wake boards, ring, canoes and windsurfer.